It is spring here: periods of sun between bouts of rain. I’ve taken the sunny days to do the spring hive assessment, which requires opening all of my hives (about 80) to check them, remove empty boxes, and give them their spring essential oil supplements (in cane syrup). I do apologize for the lack of pictures. The sunny days are short, so I’ve not stopped to take many. FIRST CHECK: ARE THEY ALIVE? Enough food, not enough heat – 2 down to that. The amount of honey the bees still have stored. b) What is she laying – if there is a preponderance of drones, she’s on her way out. If there is a high percentage of drones, this can be laying workers. BUT if there is a single egg at the bottom by the foundation of the laid cells (“bottom being next to the foundation), then I figure it’s a failing, or badly mated queen. Side Note : Queen supersedures can happen at any time a queen starts to fail and there is a larva (or larvae) with which the bees can create a queen. However, there are no drones flying in this area until April at the earliest, so any virgin who does manage to find good flying weather, will find few or no drones with which to mate). 4) Laying Workers : A high percentage of drones plus the tell-tell sign of double eggs, and eggs stuck to the sides of the cells. Diseases– looking for anything from American Foul Brood to Nosema to Varroa. Any diseased hive is marked. To be dealt with that day or evening. 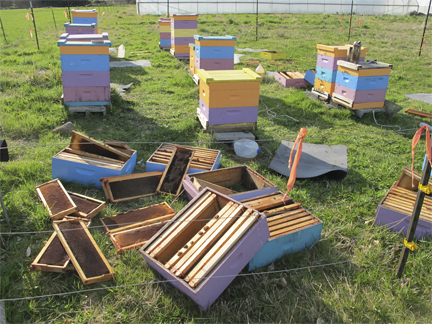 Reorganize Boxes – probably to great annoyance of the bees. I leave a lot of honey on the hives in winter, so I may find hives that are becoming honey bound. I don’t mind this – It’s like when I hike: if I come back from hiking with no food in the pack, I have seriously messed up. I want to come out of the backcountry with extra food. I want the bees to have “extra” honey when spring hits. Keep the brood area together as is, with its pollen where the bees put it. Bring honey from outer edges towards the center. Deand and/or Disease hives are marked. I know this takes time. I can do about 2 hives in 30 to 45 minutes depending on what I encounter. Somehow the problem hives always come right at the end of the day, or just before the massive rain cloud parks itself overhead and lets loose with a torrent of water. The time is well spent. When the maples flower and the dandelions bloom (some of our first flowers) the bees will be ready for the nectar flow with the resulting increase in their numbers, and not be bothered by me ripping apart their hives. All the pulled boxes still need to be scraped. I am so not looking forward to this, but it must be done. That’s part of what’s going on at Brookfield Farm Bees And Honey, Maple Falls, Washington. How do you prepare your bees for spring or fall – depending on where you are? I love learning new things, so please share. This entry was posted in Beekeeping, Brookfield Farm Bee Yards, Feeding Bees and tagged bee, Brookfield Farm, check, feed, hive, hives, Maple Falls, over winter, spring, Washington. Bookmark the permalink.